Understanding How Ultrasonic Sensors Work | MaxBotix Inc.
Ultrasonic sensing is one of the best ways to sense proximity and detect levels with high reliability. Our technical support gets emails all of the time about how our sensors work and what environments our sensors work (or don’t work) in. 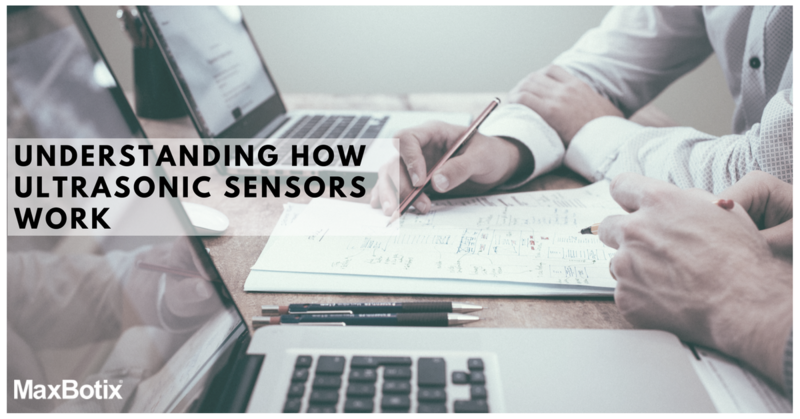 This guide was created as an introduction to ultrasonic sensing, it’s principles, and how ultrasonic sensors work in your applications. 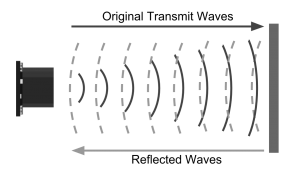 High-frequency sound waves reflect from boundaries to produce distinct echo patterns. 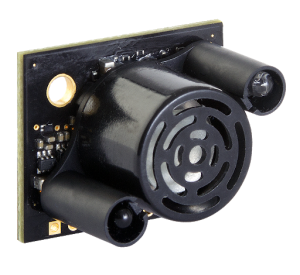 Our ultrasonic sensors, like many others, use a single transducer to send a pulse and to receive the echo. The sensor determines the distance to a target by measuring time lapses between the sending and receiving of the ultrasonic pulse. Why use an Ultrasonic Sensor? Ultrasound is reliable in any lighting environment and can be used inside or outside. Ultrasonic sensors can handle collision avoidance for a robot, and being moved often, as long as it isn’t too fast. Ultrasonics are so widely used, they can be reliably implemented in grain bin sensing applications, water level sensing, drone applications and sensing cars at your local drive-thru restaurant or bank. Ultrasonic rangefinders are commonly used as devices to detect a collision. Non-contact sensors are also referred to as proximity sensors. Long range detection of targets with varied surface properties. Ultrasonic sensors are superior to infrared sensors because they aren’t affected by smoke or black materials, however, soft materials which don’t reflect the sonar (ultrasonic) waves very well may cause issues. It’s not a perfect system, but it’s good and reliable. Ex. Distance measurement would be applied in a garage parking application, sensing when a vehicle is pulled completely into a garage. Tank level measurement, Fuel gauging, irrigation control. Our UAV Sensors for Drones as well as our proximity sensors that are used for robots are for obstacle detection. Ultrasonic sensors are a reliable, cost-effective solution for distance sensing, level, and obstacle detection. Once you understand how ultrasonic sensors work and what ultrasonic technology is perfect for and not so good for, you can make a more educated decision on the right sensor system for your application. Take a look at our patent pending solution for sensing cargo in 53′ trailers to detect the fullness or absence. Read about the Trailer Cargo Sensor. Review our product catalog and contact our Technical Support Team by clicking the button below to get help selecting a sensor. If you're considering using ultrasonic technology to sense in your project there are things you need to understand. This article provides information on how ultrasonic sensors work.